Xanthelasma palpebrarum, yellowish patches consisting of cholesterol deposits above the eyelids. These are more common in people with FH. Familial hypercholesterolemia (abbreviated FH, also spelled familial hypercholesterolaemia) is a genetic disorder characterized by high cholesterol levels, specifically very high levels of low-density lipoprotein (LDL, "bad cholesterol"), in the blood and early cardiovascular disease. Since individuals with FH underlying body biochemistry is slightly different, their high cholesterol levels are less responsive to the kinds of cholesterol control methods which are usually more effective in people without FH (such as dietary modification and statin tablets). Nevertheless, treatment (including higher statin doses) is usually effective. Many people have mutations in the LDLR gene that encodes the LDL receptor protein, which normally removes LDL from the circulation, or apolipoprotein B (ApoB), which is the part of LDL that binds with the receptor; mutations in other genes are rare. People who have one abnormal copy (are heterozygous) of the LDLR gene may develop cardiovascular disease prematurely at the age of 30 to 40. Having two abnormal copies (being homozygous) may cause severe cardiovascular disease in childhood. Heterozygous FH is a common genetic disorder, inherited in an autosomal dominant pattern, occurring in 1:500 people in most countries; homozygous FH is much rarer, occurring in 1 in a million births. Heterozygous FH is normally treated with statins, bile acid sequestrants, or other lipid lowering agents that lower cholesterol levels. New cases are generally offered genetic counseling. Homozygous FH often does not respond to medical therapy and may require other treatments, including LDL apheresis (removal of LDL in a method similar to dialysis) and occasionally liver transplantation. High cholesterol levels normally do not cause any symptoms. Yellow deposits of cholesterol-rich fat may be seen in various places on the body such as around the eyelids (known as xanthelasma palpebrarum), the outer margin of the iris (known as arcus senilis corneae), and in the tendons of the hands, elbows, knees and feet, particularly the Achilles tendon (known as a tendon xanthoma). Accelerated deposition of cholesterol in the walls of arteries leads to atherosclerosis, the underlying cause of cardiovascular disease. The most common problem in FH is the development of coronary artery disease (atherosclerosis of the coronary arteries that supply the heart) at a much younger age than would be expected in the general population. This may lead to angina pectoris (chest pain or tightness on exertion) or heart attacks. Less commonly, arteries of the brain are affected; this may lead to transient ischemic attacks (brief episodes of weakness on one side of the body or inability to talk) or occasionally stroke. Peripheral artery occlusive disease (obstruction of the arteries of the legs) occurs mainly in people with FH who smoke; this can cause pain in the calf muscles during walking that resolves with rest (intermittent claudication) and problems due to a decreased blood supply to the feet (such as gangrene). Atherosclerosis risk is increased further with age and in those who smoke, have diabetes, high blood pressure and a family history of cardiovascular disease. Approximately 85% of individuals with this disorder have not been diagnosed and consequently are not receiving lipid-lowering treatments. Physical examination findings can help a physician make the diagnosis of FH. Tendon xanthomas are seen in 20-40% of individuals with FH and are pathognomonic for the condition. 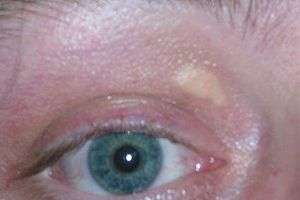 A xanthelasma or corneal arcus may also be seen. These common signs are supportive of the diagnosis, but are non-specific findings. Cholesterol levels may be determined as part of health screening for health insurance or occupational health, when the external physical signs such as xanthelasma, xanthoma, arcus are noticed, symptoms of cardiovascular disease develop, or a family member has been found to have FH. A pattern compatible with hyperlipoproteinemia type IIa on the Fredrickson classification is typically found: raised level of total cholesterol, markedly raised level of low-density lipoprotein (LDL), normal level of high-density lipoprotein (HDL), and normal level of triglycerides. Total cholesterol levels of 350–550 mg/dL are typical of heterozygous FH while total cholesterol levels of 650–1000 mg/dL are typical of homozygous FH. The LDL is typically above the 75th percentile, that is, 75% of the healthy population would have a lower LDL level. Cholesterol levels can be drastically higher in people with FH who are also obese. On the basis of the isolated high LDL and clinical criteria (which differ by country), genetic testing for LDL receptor mutations and ApoB mutations can be performed. Mutations are detected in between 50 and 80% of cases; those without a mutation often have higher triglyceride levels and may in fact have other causes for their high cholesterol, such as combined hyperlipidemia due to metabolic syndrome. FH needs to be distinguished from familial combined hyperlipidemia and polygenic hypercholesterolemia. Lipid levels and the presence of xanthomata can confirm the diagnosis. Sitosterolemia and cerebrotendineous xanthomatosis are two rare conditions that can also present with premature atherosclerosis and xanthomas. The latter condition can also involve neurological or psychiatric manifestations, cataracts, diarrhea and skeletal abnormalities. The most common genetic defects in FH are LDLR mutations (prevalence 1 in 500, depending on the population), ApoB mutations (prevalence 1 in 1000), PCSK9 mutations (less than 1 in 2500) and LDLRAP1. The related disease sitosterolemia, which has many similarities with FH and also features cholesterol accumulation in tissues, is due to ABCG5 and ABCG8 mutations. Schematic representation of the LDL receptor protein. The LDL receptor gene is located on the short arm of chromosome 19 (19p13.1-13.3). It comprises 18 exons and spans 45 kb, and the protein gene product contains 839 amino acids in mature form. A single abnormal copy (heterozygote) of FH causes cardiovascular disease by the age of 50 in about 40% of cases. Having two abnormal copies (homozygote) causes accelerated atherosclerosis in childhood, including its complications. The plasma LDL levels are inversely related to the activity of LDL receptor (LDLR). Homozygotes have LDLR activity of less than 2%, while heterozygotes have defective LDL processing with receptor activity being 2–25%, depending on the nature of the mutation. Over 1000 different mutations are known. Class I: LDLR is not synthesized at all. Class II: LDLR is not properly transported from the endoplasmic reticulum to the Golgi apparatus for expression on the cell surface. Class III: LDLR does not properly bind LDL on the cell surface because of a defect in either apolipoprotein B100 (R3500Q) or in LDL-R.
Class IV: LDLR bound to LDL does not properly cluster in clathrin-coated pits for receptor-mediated endocytosis (pathway step 2). 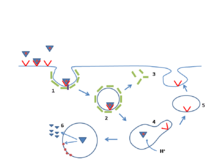 Class V: LDLR is not recycled back to the cell surface (pathway step 5). Apolipoprotein B, in its ApoB100 form, is the main apolipoprotein, or protein part of the lipoprotein particle. Its gene is located on the second chromosome (2p24-p23) and is between 21.08 and 21.12 Mb long. FH is often associated with the mutation of R3500Q, which causes replacement of arginine by glutamine at position 3500. 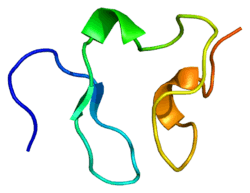 The mutation is located on a part of the protein that normally binds with the LDL receptor, and binding is reduced as a result of the mutation. Like LDLR, the number of abnormal copies determines the severity of the hypercholesterolemia. Mutations in the proprotein convertase subtilisin/kexin type 9 (PCSK9) gene were linked to autosomal dominant (i.e. requiring only one abnormal copy) FH in a 2003 report. The gene is located on the first chromosome (1p34.1-p32) and encodes a 666 amino acid protein that is expressed in the liver. It has been suggested that PCSK9 causes FH mainly by reducing the number of LDL receptors on liver cells. Abnormalities in the ARH gene, also known as LDLRAP1, were first reported in a family in 1973. In contrast to the other causes, two abnormal copies of the gene are required for FH to develop (autosomal recessive). The mutations in the protein tend to cause the production of a shortened protein. Its real function is unclear, but it seems to play a role in the relation between the LDL receptor and clathrin-coated pits. People with autosomal recessive hypercholesterolemia tend to have more severe disease than LDLR-heterozygotes but less severe than LDLR-homozygotes. Cholesterol is synthesized in the HMG-CoA reductase pathway. LDL cholesterol normally circulates in the body for 2.5 days, and subsequently the apolipoprotein B portion of LDL cholesterol binds to the LDL receptor on the liver cells, triggering its uptake and digestion. This process results in the removal of LDL from the circulatory system. Synthesis of cholesterol by the liver is suppressed in the HMG-CoA reductase pathway. In FH, LDL receptor function is reduced or absent, and LDL circulates for an average duration of 4.5 days, resulting in significantly increased level of LDL cholesterol in the blood with normal levels of other lipoproteins. In mutations of ApoB, reduced binding of LDL particles to the receptor causes the increased level of LDL cholesterol. It is not known how the mutation causes LDL receptor dysfunction in mutations of PCSK9 and ARH. Although atherosclerosis occurs to a certain degree in all people, people with FH may develop accelerated atherosclerosis due to the excess level of LDL. The degree of atherosclerosis approximately depends on the number of LDL receptors still expressed and the functionality of these receptors. In many heterozygous forms of FH, the receptor function is only mildly impaired, and LDL levels will remain relatively low. In the more serious homozygous forms, the receptor is not expressed at all. Some studies of FH cohorts suggest that additional risk factors are generally at play when a person develops atherosclerosis. In addition to the classic risk factors such as smoking, high blood pressure, and diabetes, genetic studies have shown that a common abnormality in the prothrombin gene (G20210A) increases the risk of cardiovascular events in people with FH. Several studies found that a high level of lipoprotein(a) was an additional risk factor for ischemic heart disease. The risk was also found to be higher in people with a specific genotype of the angiotensin-converting enzyme (ACE). Screening among family members of people with known FH is cost-effective. Other strategies such as universal screening at the age of 16 were suggested in 2001. The latter approach may however be less cost-effective in the short term. Screening at an age lower than 16 was thought likely to lead to an unacceptably high rate of false positives. A 2007 meta-analysis found that "the proposed strategy of screening children and parents for familial hypercholesterolaemia could have considerable impact in preventing the medical consequences of this disorder in two generations simultaneously." "The use of total cholesterol alone may best discriminate between people with and without FH between the ages of 1 to 9 years." Screening of toddlers has been suggested, and results of a trial on 10,000 one-year-olds were published in 2016. Work was needed to find whether screening was cost-effective, and acceptable to families. FH is usually treated with statins. Statins act by inhibiting the enzyme hydroxymethylglutaryl CoA reductase (HMG-CoA-reductase) in the liver. In response, the liver produces more LDL receptors, which remove circulating LDL from the blood. Statins effectively lower cholesterol and LDL levels, although sometimes add-on therapy with other drugs is required, such as bile acid sequestrants (cholestyramine or colestipol), nicotinic acid preparations or fibrates. Control of other risk factors for cardiovascular disease is required, as risk remains somewhat elevated even when cholesterol levels are controlled. Professional guidelines recommend that the decision to treat a person with FH with statins should not be based on the usual risk prediction tools (such as those derived from the Framingham Heart Study), as they are likely to underestimate the risk of cardiovascular disease; unlike the rest of the population, FH have had high levels of cholesterol since birth, probably increasing their relative risk. Prior to the introduction of the statins, clofibrate (an older fibrate that often caused gallstones), probucol (especially in large xanthomas) and thyroxine were used to reduce LDL cholesterol levels. More controversial is the addition of ezetimibe, which inhibits cholesterol absorption in the gut. While it reduces LDL cholesterol, it does not appear to improve a marker of atherosclerosis called the intima-media thickness. Whether this means that ezetimibe is of no overall benefit in FH is unknown. There are no interventional studies that directly show mortality benefit of cholesterol lowering in FH. Rather, evidence of benefit is derived from a number of trials conducted in people who have polygenic hypercholesterolemia (in which heredity plays a smaller role). Still, a 1999 observational study of a large British registry showed that mortality in people with FH had started to improve in the early 1990s when statins were introduced. A cohort study suggested that treatment of FH with statins leads to a 48% reduction in death from coronary heart disease to a point where people are no more likely to die of coronary heart disease than the general population. However, if the person already had coronary heart disease the reduction was 25%. The results emphasize the importance of early identification of FH and treatment with statins. Alirocumab and evolocumab, both monoclonal antibodies against PCSK9, are specifically indicated as adjunct to diet and maximally tolerated statin therapy for the treatment of adults with heterozygous familial hypercholesterolemia, who require additional lowering of LDL cholesterol. Homozygous FH is harder to treat. The LDL receptors are minimally functional, if at all. Only high doses of statins, often in combination with other medications, are modestly effective in improving lipid levels. If medical therapy is not successful at reducing cholesterol levels, LDL apheresis may be used; this filters LDL from the bloodstream in a process reminiscent of dialysis. Very severe cases may be considered for a liver transplant; this provides a liver with normally functional LDL receptors, and leads to rapid improvement of the cholesterol levels, but at the risk of complications from any solid organ transplant (such as rejection, infections, or side-effects of the medication required to suppress rejection). Other surgical techniques include partial ileal bypass surgery, in which part of the small bowel is bypassed to decrease the absorption of nutrients and hence cholesterol, and portacaval shunt surgery, in which the portal vein is connected to the vena cava to allow blood with nutrients from the intestine to bypass the liver. Lomitapide, an inhibitor of the microsomal triglyceride transfer protein, was approved by the US FDA in December 2012 as an orphan drug for the treatment of homozygous familial hypercholesterolemia. In January 2013, The US FDA also approved mipomersen, which inhibits the action of the gene apolipoprotein B, for the treatment of homozygous familial hypercholesterolemia. Gene therapy is a possible future alternative. Given that FH is present from birth and atherosclerotic changes may begin early in life, it is sometimes necessary to treat adolescents or even teenagers with agents that were originally developed for adults. Due to safety concerns, many physicians prefer to use bile acid sequestrants and fenofibrate as these are licensed in children. Nevertheless, statins seem safe and effective, and in older children may be used as in adults. An expert panel in 2006 advised on early combination therapy with LDL apheresis, statins and cholesterol absorption inhibitors in children with homozygous FH at the highest risk. The global prevalence of FH is approximately 10 million people. In most populations studied, heterozygous FH occurs in about 1:500 people, but not all develop symptoms. Homozygous FH occurs in about 1:1,000,000. LDLR mutations are more common in certain populations, presumably because of a genetic phenomenon known as the founder effect—they were founded by a small group of individuals, one or several of whom was a carrier of the mutation. The Afrikaner, French Canadians, Lebanese Christians, and Finns have high rates of specific mutations that make FH particularly common in these groups. APOB mutations are more common in Central Europe. The Norwegian physician Dr C. Müller first associated the physical signs, high cholesterol levels and autosomal dominant inheritance in 1938. In the early 1970s and 1980s, the genetic cause for FH was described by Dr Joseph L. Goldstein and Dr Michael S. Brown of Dallas, Texas. Initially, they found increased activity of HMG-CoA reductase, but studies showed that this did not explain the very abnormal cholesterol levels in people with FH. The focus shifted to the binding of LDL to its receptor, and effects of impaired binding on metabolism; this proved to be the underlying mechanism for FH. Subsequently numerous mutations in the protein were directly identified by sequencing. They later won the 1985 Nobel Prize in Medicine for their discovery of the LDL receptor and its impact on lipoprotein metabolism. 1 2 3 4 5 6 7 8 9 10 11 12 13 14 15 16 17 Rader DJ, Cohen J, Hobbs HH (2003). "Monogenic hypercholesterolemia: new insights in pathogenesis and treatment". J. Clin. Invest. 111 (12): 1795–803. doi:10.1172/JCI18925. PMC 161432 . PMID 12813012. ↑ Tsouli SG, Kiortsis DN, Argyropoulou MI, Mikhailidis DP, Elisaf MS (2005). "Pathogenesis, detection and treatment of Achilles tendon xanthomas". Eur. J. Clin. Invest. 35 (4): 236–44. doi:10.1111/j.1365-2362.2005.01484.x. PMID 15816992. 1 2 3 4 5 6 Durrington P (2003). "Dyslipidaemia". Lancet. 362 (9385): 717–31. doi:10.1016/S0140-6736(03)14234-1. PMID 12957096. ↑ Jansen AC, van Aalst-Cohen ES, Tanck MW, et al. (2004). "The contribution of classical risk factors to cardiovascular disease in familial hypercholesterolaemia: data in 2400 patients". J. Intern. Med. 256 (6): 482–90. doi:10.1111/j.1365-2796.2004.01405.x. PMID 15554949. ↑ Williams RR, Hunt SC, Schumacher MC, et al. (1993). "Diagnosing heterozygous familial hypercholesterolemia using new practical criteria validated by molecular genetics". Am J Cardiol. 2 (72): 171–76. 1 2 3 4 5 6 7 8 9 Repas TB, Tanner JR (February 2014). "Preventing early cardiovascular death in patients with familial hypercholesterolemia". J Am Osteopath Assoc. 114 (2): 99–108. doi:10.7556/jaoa.2014.023. PMID 24481802. ↑ van Aalst-Cohen ES, Jansen AC, Tanck MW, et al. (2006). "Diagnosing familial hypercholesterolaemia: the relevance of genetic testing". Eur. Heart J. 27 (18): 2240–6. doi:10.1093/eurheartj/ehl113. PMID 16825289. ↑ Moghadasian MH, Salen G, Frohlich JJ, Scudamore CH (April 2002). "Cerebrotendinous xanthomatosis: a rare disease with diverse manifestations". Arch. Neurol. 59 (4): 527–9. doi:10.1001/archneur.59.4.527. PMID 11939886. 1 2 Hobbs HH, Brown MS, Goldstein JL (1992). "Molecular genetics of the LDLR gene in familial hypercholesterolemia". Hum. Mutat. 1 (6): 445–66. doi:10.1002/humu.1380010602. PMID 1301956. ↑ Vega GL, Grundy SM (1986). "In vivo evidence for reduced binding of low density lipoproteins to receptors as a cause of primary moderate hypercholesterolemia". J. Clin. Invest. 78 (5): 1410–4. doi:10.1172/JCI112729. PMC 423848 . PMID 3771801. ↑ Abifadel M, Varret M, Rabès JP, et al. (2003). "Mutations in PCSK9 cause autosomal dominant hypercholesterolemia". Nat. Genet. 34 (2): 154–6. doi:10.1038/ng1161. PMID 12730697. ↑ Seidah NG, Khatib AM, Prat A (2006). 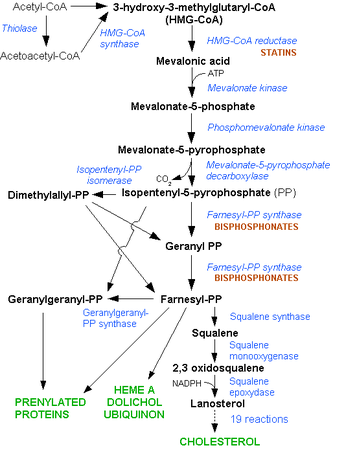 "The proprotein convertases and their implication in sterol and/or lipid metabolism" (PDF). Biol. Chem. 387 (7): 871–7. doi:10.1515/BC.2006.110. PMID 16913836. ↑ Khachadurian AK, Uthman SM (1973). "Experiences with the homozygous cases of familial hypercholesterolemia. A report of 52 patients". Nutr Metab. 15 (1): 132–40. doi:10.1159/000175431. PMID 4351242. ↑ Brown MS, Goldstein JL (1974). "Familial hypercholesterolemia: defective binding of lipoproteins to cultured fibroblasts associated with impaired regulation of 3-hydroxy-3-methylglutaryl coenzyme A reductase activity". Proc. Natl. Acad. Sci. U.S.A. 71 (3): 788–92. doi:10.1073/pnas.71.3.788. PMC 388099 . PMID 4362634. ↑ Scientific Steering Committee on behalf of the Simon Broome Register Group (1991). "Risk of fatal coronary heart disease in familial hypercholesterolaemia". BMJ. 303 (6807): 893–6. doi:10.1136/bmj.303.6807.893. PMC 1671226 . PMID 1933004. ↑ Sijbrands EJ, Westendorp RG, Defesche JC, de Meier PH, Smelt AH, Kastelein JJ (2001). "Mortality over two centuries in large pedigree with familial hypercholesterolaemia: family tree mortality study". BMJ. 322 (7293): 1019–23. doi:10.1136/bmj.322.7293.1019. PMC 31037 . PMID 11325764. ↑ Jansen AC, van Aalst-Cohen ES, Tanck MW, et al. (2005). "Genetic determinants of cardiovascular disease risk in familial hypercholesterolemia". Arterioscler. Thromb. Vasc. Biol. 25 (7): 1475–81. doi:10.1161/01.ATV.0000168909.44877.a7. PMID 15879303. ↑ Wiklund, O.; Angelin, B.; Olofsson, S. O.; Eriksson, M.; Fager, G.; Berglund, L.; Bondjers, G. (Jun 1990). "Apolipoprotein(a) and ischaemic heart disease in familial hypercholesterolaemia" (Free full text). Lancet. 335 (8702): 1360–1363. doi:10.1016/0140-6736(90)91242-3. PMID 1971660. ↑ Seed, M.; Hoppichler, F.; Reaveley, D.; Mccarthy, S.; Thompson, G. R.; Boerwinkle, E.; Utermann, G. (May 1990). "Relation of serum lipoprotein(a) concentration and apolipoprotein(a) phenotype to coronary heart disease in patients with familial hypercholesterolemia" (Free full text). The New England Journal of Medicine. 322 (21): 1494–1499. doi:10.1056/NEJM199005243222104. ISSN 0028-4793. PMID 2139920. ↑ O'Malley JP, Maslen CL, Illingworth DR (19 May 1998). "Angiotensin-converting enzyme DD genotype and cardiovascular disease in heterozygous familial hypercholesterolemia". Circulation. 97 (18): 1780–3. doi:10.1161/01.CIR.97.18.1780. PMID 9603531. ↑ Besseling, J; Sjouke, B; Kastelein, JJ (August 2015). "Screening and treatment of familial hypercholesterolemia - Lessons from the past and opportunities for the future (based on the Anitschkow Lecture 2014).". Atherosclerosis. 241 (2): 597–606. doi:10.1016/j.atherosclerosis.2015.06.011. PMID 26115072. ↑ Marks D, Wonderling D, Thorogood M, Lambert H, Humphries SE, Neil HA (June 2002). "Cost effectiveness analysis of different approaches of screening for familial hypercholesterolaemia". BMJ. 324 (7349): 1303. doi:10.1136/bmj.324.7349.1303. PMC 113765 . PMID 12039822. ↑ Umans-Eckenhausen MA, Defesche JC, Sijbrands EJ, Scheerder RL, Kastelein JJ (January 2001). "Review of first 5 years of screening for familial hypercholesterolaemia in the Netherlands". Lancet. 357 (9251): 165–8. doi:10.1016/S0140-6736(00)03587-X. PMID 11213091. ↑ Marks D, Thorogood M, Neil HA, Wonderling D, Humphries SE (March 2003). "Comparing costs and benefits over a 10 year period of strategies for familial hypercholesterolaemia screening" (PDF). J Public Health Med. 25 (1): 47–52. doi:10.1093/pubmed/fdg010. PMID 12669918. 1 2 Wald, David S.; Bestwick, Jonathan P.; Wald, Nicholas J. (2007-09-20). "Child-parent screening for familial hypercholesterolaemia: screening strategy based on a meta-analysis". BMJ. 335 (7620): 599. doi:10.1136/bmj.39300.616076.55. ISSN 0959-8138. PMC 1989026 . PMID 17855284. ↑ Saenger, Amy K. (2012-08-01). "Universal Lipid Screening in Children and Adolescents: A Baby Step toward Primordial Prevention?". Clinical Chemistry. 58 (8): 1179–1181. doi:10.1373/clinchem.2012.182287. ISSN 0009-9147. PMID 22510399. ↑ Caroline Parkinson (27 October 2016). "Toddlers 'should get heart risk test'". BBC News. Retrieved 27 October 2016. ↑ Wald, David S.; Bestwick, Jonathan P.; Morris, Joan K.; Whyte, Ken; Jenkins, Lucy; Wald, Nicholas J. (2016). "Child–Parent Familial Hypercholesterolemia Screening in Primary Care". New England Journal of Medicine. 375 (17): 1628–1637. doi:10.1056/NEJMoa1602777. ISSN 0028-4793. ↑ National Institute for Health and Clinical Excellence. Clinical guideline 71: Familial hypercholesterolaemia. London, 2008. ↑ Kastelein JJ, Akdim F, Stroes ES, et al. (April 2008). "Simvastatin with or without ezetimibe in familial hypercholesterolemia". N. Engl. J. Med. 358 (14): 1431–43. doi:10.1056/NEJMoa0800742. PMID 18376000. ↑ Scientific Steering Committee on behalf of the Simon Broome Register Group (1999). "Mortality in treated heterozygous familial hypercholesterolaemia: implications for clinical management". Atherosclerosis. 142 (1): 105–12. doi:10.1016/S0021-9150(98)00200-7. PMID 9920511. ↑ Neil A, Cooper J, Betteridge J, et al. (November 2008). "Reductions in all-cause, cancer, and coronary mortality in statin-treated patients with heterozygous familial hypercholesterolaemia: a prospective registry study". Eur. Heart J. 29 (21): 2625–33. doi:10.1093/eurheartj/ehn422. PMC 2577142 . PMID 18840879. ↑ Ito, MK; Santos, RD (16 May 2016). "PCSK9 inhibition with monoclonal antibodies-modern management of hypercholesterolemia.". Journal of clinical pharmacology. Online first. doi:10.1002/jcph.766. PMID 27195910. ↑ Bilheimer DW, Goldstein JL, Grundy SM, Starzl TE, Brown MS (December 1984). "Liver transplantation to provide low-density-lipoprotein receptors and lower plasma cholesterol in a child with homozygous familial hypercholesterolemia". N. Engl. J. Med. 311 (26): 1658–64. doi:10.1056/NEJM198412273112603. PMC 2975980 . PMID 6390206. ↑ Revell SP, Noble-Jamieson G, Johnston P, Rasmussen A, Jamieson N, Barnes ND (November 1995). "Liver transplantation for homozygous familial hypercholesterolaemia". Arch. Dis. Child. 73 (5): 456–8. doi:10.1136/adc.73.5.456. PMC 1511367 . PMID 8554367. ↑ López-Santamaria M, Migliazza L, Gamez M, et al. (April 2000). "Liver transplantation in patients with homozygotic familial hypercholesterolemia previously treated by end-to-side portocaval shunt and ileal bypass". J. Pediatr. Surg. 35 (4): 630–3. doi:10.1053/jpsu.2000.0350630. PMID 10770402. ↑ Buchwald H, Varco RL, Boen JR, et al. (June 1998). "Effective lipid modification by partial ileal bypass reduced long-term coronary heart disease mortality and morbidity: five-year posttrial follow-up report from the POSCH. Program on the Surgical Control of the Hyperlipidemias". Arch. Intern. Med. 158 (11): 1253–61. doi:10.1001/archinte.158.11.1253. PMID 9625405. ↑ Bilheimer DW, Goldstein JL, Grundy SM, Brown MS (December 1975). "Reduction in cholesterol and low density lipoprotein synthesis after portacaval shunt surgery in a patient with homozygous familial hypercholesterolemia". J. Clin. Invest. 56 (6): 1420–30. doi:10.1172/JCI108223. PMC 333120 . PMID 172531. ↑ Cuchel M, Bloedon LT, Szapary PO, et al. (January 2007). "Inhibition of microsomal triglyceride transfer protein in familial hypercholesterolemia". N. Engl. J. Med. 356 (2): 148–56. doi:10.1056/NEJMoa061189. PMID 17215532. ↑ Grossman M, Rader DJ, Muller DW, et al. (November 1995). "A pilot study of ex vivo gene therapy for homozygous familial hypercholesterolaemia". Nat. Med. 1 (11): 1148–54. doi:10.1038/nm1195-1148. PMID 7584986. ↑ Mabuchi H, Koizumi J, Shimizu M, Takeda R (February 1989). "Development of coronary heart disease in familial hypercholesterolemia". Circulation. 79 (2): 225–32. doi:10.1161/01.CIR.79.2.225. PMID 2914343. 1 2 Greene O, Durrington P (May 2004). "Clinical management of children and young adults with heterozygous familial hypercholesterolaemia in the UK". J R Soc Med. 97 (5): 226–9. doi:10.1258/jrsm.97.5.226. PMC 1079462 . PMID 15121812. ↑ Rodenburg J, Vissers MN, Wiegman A, Trip MD, Bakker HD, Kastelein JJ (August 2004). "Familial hypercholesterolemia in children". Curr. Opin. Lipidol. 15 (4): 405–11. doi:10.1097/01.mol.0000137228.92396.f3. PMID 15243213. ↑ Wiegman A, Hutten BA, de Groot E, et al. (July 2004). "Efficacy and safety of statin therapy in children with familial hypercholesterolemia: a randomized controlled trial". JAMA. 292 (3): 331–7. doi:10.1001/jama.292.3.331. PMID 15265847. ↑ Kavey RE, Allada V, Daniels SR, et al. (December 2006). "Cardiovascular risk reduction in high-risk pediatric patients: a scientific statement from the American Heart Association Expert Panel on Population and Prevention Science; the Councils on Cardiovascular Disease in the Young, Epidemiology and Prevention, Nutrition, Physical Activity and Metabolism, High Blood Pressure Research, Cardiovascular Nursing, and the Kidney in Heart Disease; and the Interdisciplinary Working Group on Quality of Care and Outcomes Research: endorsed by the American Academy of Pediatrics". Circulation. 114 (24): 2710–38. doi:10.1161/CIRCULATIONAHA.106.179568. PMID 17130340. ↑ Müller C (1938). "Xanthoma, hypercholesterolemia, angina pectoris". Acta Med Scandinav. 95 Suppl (89): 75. doi:10.1111/j.0954-6820.1938.tb19279.x. ↑ Goldstein JL, Brown MS (October 1973). "Familial hypercholesterolemia: identification of a defect in the regulation of 3-hydroxy-3-methylglutaryl coenzyme A reductase activity associated with overproduction of cholesterol". Proc. Natl. Acad. Sci. U.S.A. 70 (10): 2804–8. doi:10.1073/pnas.70.10.2804. PMC 427113 . PMID 4355366. ↑ Brown MS, Goldstein JL (January 1976). "Receptor-mediated control of cholesterol metabolism" (PDF). Science. 191 (4223): 150–4. doi:10.1126/science.174194. PMID 174194. ↑ Nobelprize.org. "Medicine 1985". Retrieved 2008-02-28.